Happiness Happens at Studio 659 is a curated group show that continues through this Saturday, September 24. Studio 659 is located 20 minutes outside of Chicago in NW Indiana in the Historic Downtown District of Whiting, Indiana at 1413 119th Street. The theme, of course, is what makes you happy? Artists are exhibiting their expressions of happiness, joy, elation or whatever expresses “feel-good vibes” in their artwork. I have often combined my love of travel with painting, but few places are as beautiful and hospitable as Barra de Navidad, a coastal village on the western shore of Mexico where the small local population mingles with tourists and artists. I fled the Chicago cold and stayed in Barra for a month one winter, where I rented a cottage right on the beach. Sun-drenched local scenes abound like the fishing ships returning with the morning catch and local women wading in the sea Other paintings inspired my trip to Barra de Navidad are on my web site. 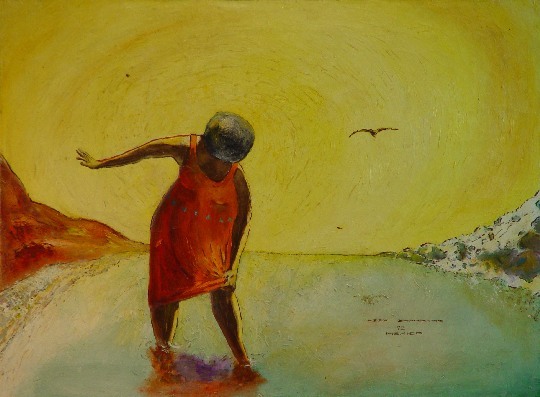 This entry was posted in Openings and Events and tagged "Chicago artists", "figurative painting", fine art, Mexico, regional art. Bookmark the permalink. Thanks so much for your appreciation of my art.